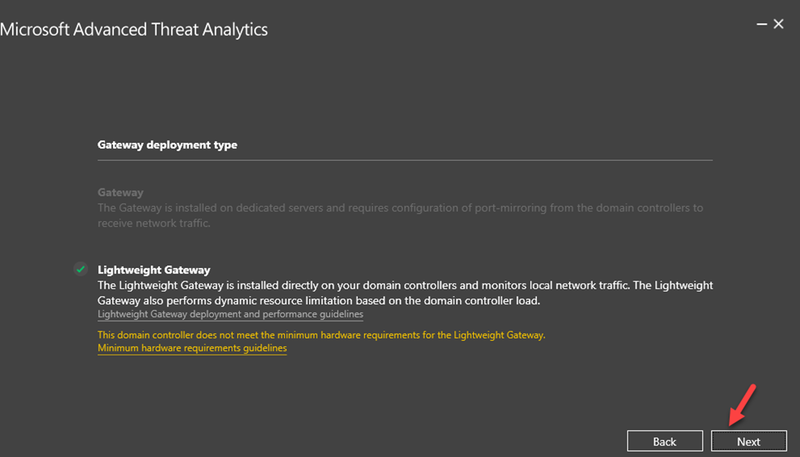 Windows Admin Center – Rich Server Management Experience! In last ignite (2017) Microsoft Released technical preview of “Project Honolulu” which aimed to provide light weight but powerful server management experience for windows users. 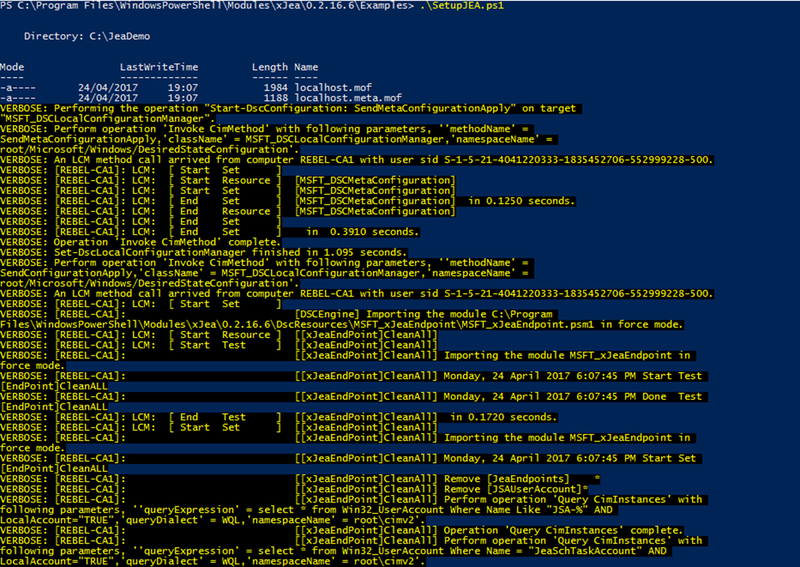 I already covered it with detail blog post http://www.rebeladmin.com/2017/10/project-honolulu-better-windows-server-management-experience/ . 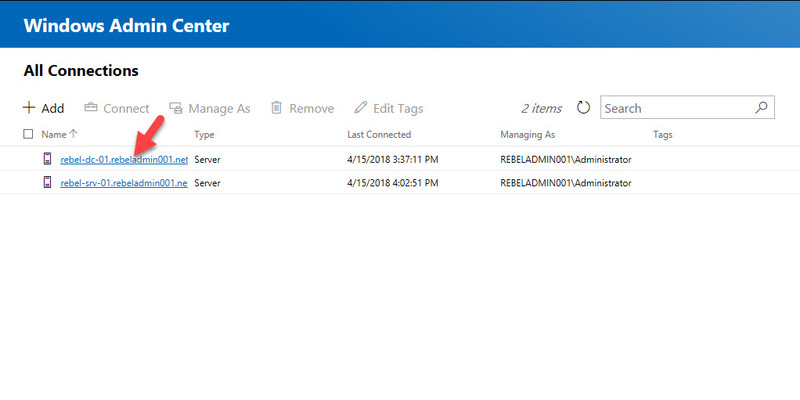 Now the waiting is over and it is generally available as Windows Admin Center. As Windows Users we use many different MMC to manage roles/features. We also use those to troubleshoot issues. If it is remote computers most of the time we keep RDP or use other methods to dial in. With Windows Admin Center now we can access all these consoles in one web based interface in secure, easy, well integrated way. It can connect other remote computers as well. Easy to Deploy – It is easy to deploy. Can install in windows 10 or Windows 2016 server and start to manage device with in few minutes. Manage from Internal networks or external networks – This solution is web based. It can be access from internal network and same can publish to external networks with minimum configuration changes. 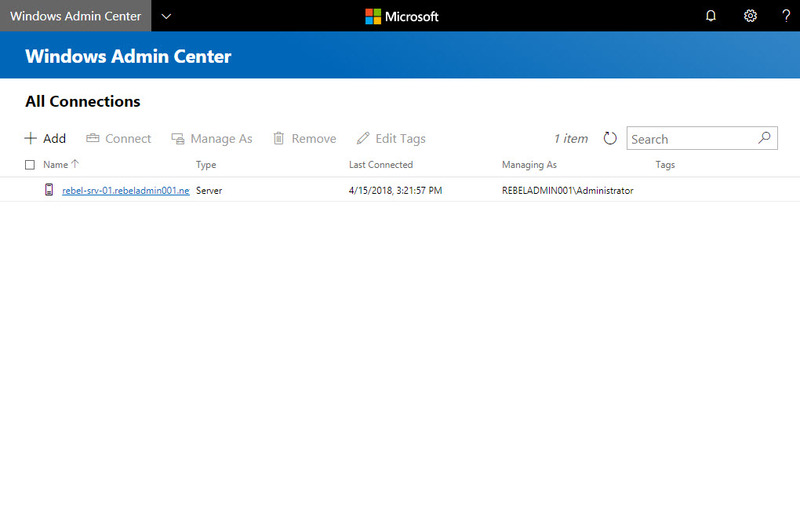 Better Access Control – Windows Admin Center supports role based access control and gateway authentication option included local groups, Windows Active Directory and Azure Active Directory. Extensibility – Microsoft will offer SDK which will allow 3rd party vendors to develop solutions and allow to integrate with windows admin center to manage their solutions. 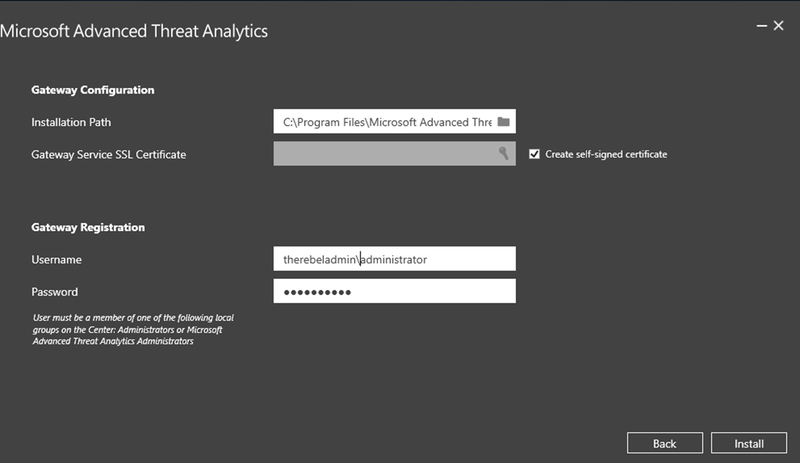 Windows Admin Center have two components. Web Server – It is the UI for Windows Admin Center and users can access it via HTTPS requests. It also can publish to remote networks to allow users to connect via web browser. 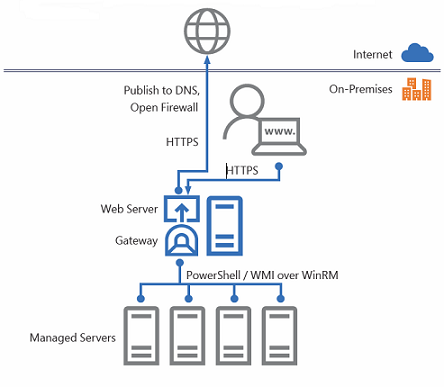 Gateway – Gateway is to manage connected servers via Remote PowerShell and WMI over WinRM. WAC will come default with upcoming windows server 2019. At the moment it can install on windows 10 in desktop mode which connect to the WAC gateway from the same computer where it is installed. 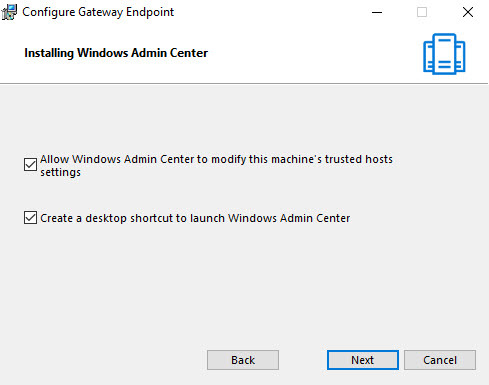 It can also install on windows server 2016 in gateway mode which allows to Connect to WAC gateway from a client browser on a remote machine. WAC can manage any systems from windows server 2012. What about System Center and OMS? This is not replacement for high end infrastructure management solution such as SCCM and OMS. WAC will add additional management experience, if you already have those solution in place. Yes, WAC supports Azure Integration. 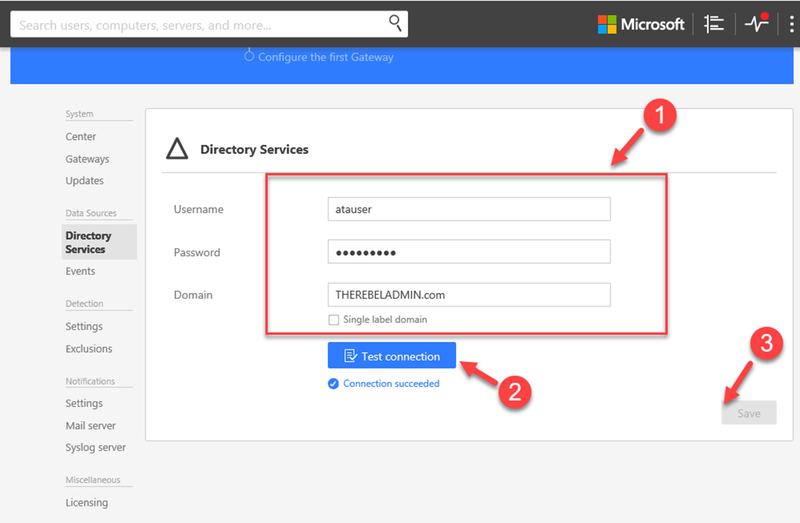 Azure AD can use for WAC gateway authentication. By providing gateway access to Azure VNet, WAC can manage Azure VM. WAC can also manage Azure Site Recovery activities. In my demo I am going to install WAC in windows server 2016. 3) Double click on the .msi file to begin the installation. 5) Then it asks how you like to update it, select the default and click Next to proceed. 6) In next window select option to allow installed to modify trusted host settings. In same window we also can select to create desktop shortcut if needed. 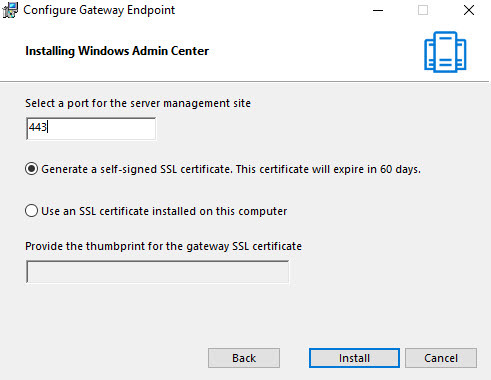 7) In next window we can define the port and certificate for the management site. The default port is 443. In demo I am going to use self-sign cert. Note – WAC not supported on IE. So, you need to use Edge or another browser to access it. 14) Then type the FQDN for the PC that you like to add. It should be able to resolve from the server. then click on Submit. Note – Windows 10 do not have Powershell or WinRM remoting by default. To enable it you must run Enable-PSRemoting from PowerShell windows running as admin. 15) Once servers/pc are added you can connect to it by just clicking on the server/pc from the list. 16) For remote devices, it will ask as who you like to login. Provide the relevant admin login details and click on Continue. Now we have basic setup of WAC. In next posts we are going to look in to different features of WAC. This marks the end of the blog post and hope it was useful. If you have any questions feel free to contact me on rebeladm@live.com also follow me on twitter @rebeladm to get updates about new blog posts. Services Accounts are recommended to use when install application or services in infrastructure. It is dedicated account with specific privileges which use to run services, batch jobs, management tasks. In most of the infrastructures, service accounts are typical user accounts with “Password never expire” option. 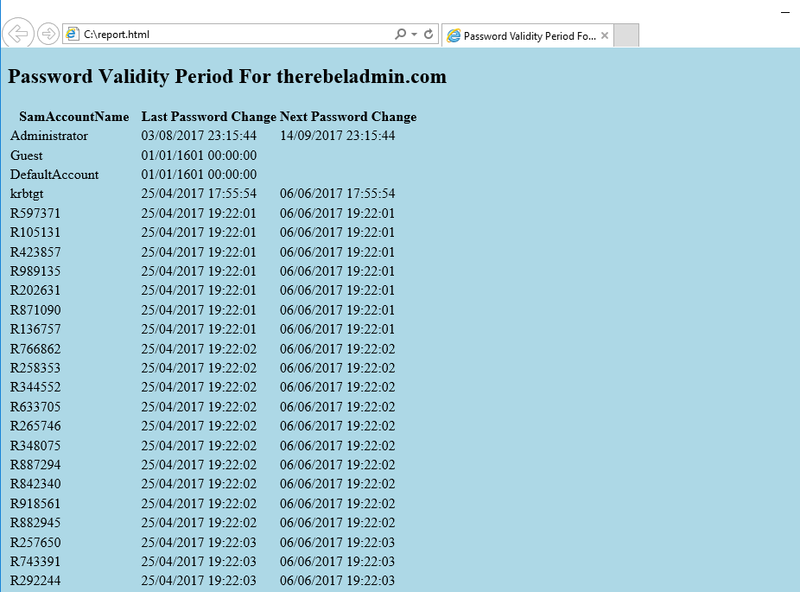 Since these service accounts are not been use regularly, Administrators have to keep track of these accounts and their credentials. I have seen in many occasions where engineers face in to issues due to outdated or misplace service account credential details. Pain of it is, if you reset the password of service accounts, you will need to update services, databases, application settings to get application or services up and running again. Apart from it Engineers also have to manage service principle names (SPN) which helps to identify service instance uniquely. • No more password management. It uses a complex, random, 240-character password and change that automatically when it reaches the domain or computer password expire date. • It cannot be lock out or use for interactive login. • Simplified SPN Management – System will automatically change the SPN value if sAMaccount details of the computer change or DNS name property change. In order to create Managed service account, we can use following command, I am running this from the domain controller. In above command I am creating service account called MyAcc1 and I am restricting it to one computer. 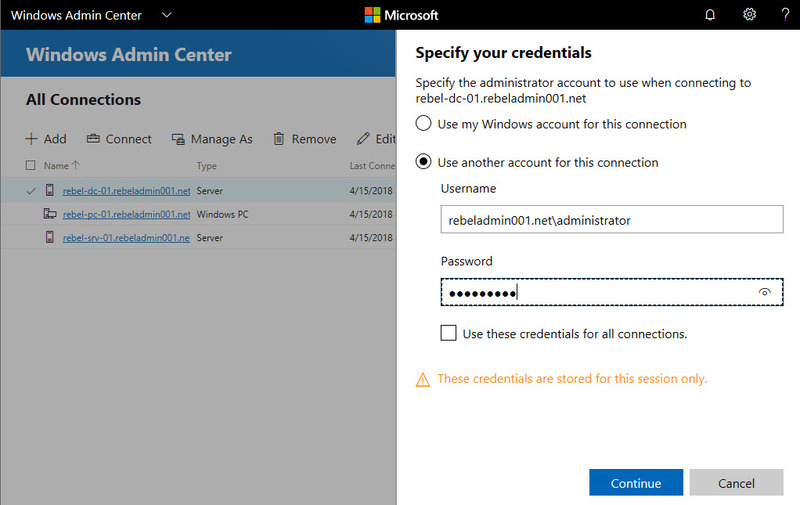 Next step is associate the service account with the Host REBEL-SRV01 where I am going to use this service account. Add-ADComputerServiceAccount -Identity REBEL-SRV01 -ServiceAccount "MyAcc1"
It is return the value True which means the test is successful. Tip – When configure the Manager service account in service make sure to leave the password as empty. You do not need to define any password there as system auto generate the password. Similar to any other active directory object, OU structure can manage using Active Directory Administrative Center (ADAC), Active Directory Users and Computers (ADUC) MMC and PowerShell. 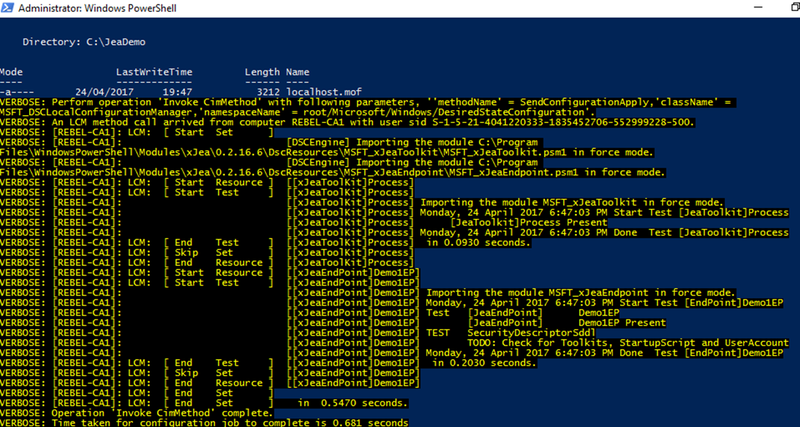 In this post, I am going to demonstrate how to manage OU structure using PowerShell. As the first step, I am going to create new OU called “Asia” to represent Asia Branch. New-ADOrganizationalUnit -Name "Asia" -Description "Asia Branch"
Tip – When you use ManagedBy attribute, make sure to use existing active directory object for the value. It can be individual user object or group object. If not, command will fail. “Protect from Accidental Deletion” for OU object is nice small safe guard we can apply. It will prevent Accidental OU object deletion. This will be apply by default if you create OU using ADAC or ADUC. As the next step, I am going to create Sub OU under Asia OU Called “Users”. Above command will create OU called Users under path OU=Asia,DC=rebeladmin,DC=com. It is also protected from accidental deletion. Now we have OU structure created and next step is move objects to it. for that we can use Move-ADObject cmdlet. We also can move multiple object to the new OU. In above command, It will first search all the user accounts what is starts with “Test” in OU=Users,OU=Europe,DC=rebeladmin,DC=com and then move all objects it found to new OU path. Tip – If you have ProtectedFromAccidentalDeletion enable on objects, it will not allow to move object to different OU. It need to remove before object move. If we need to remove OU object it can be done using Remove-ADOrganizationalUnit cmdlet. Above command will remove OU=Laptops,OU=Europe,DC=rebeladmin,DC=com Organization Unit. 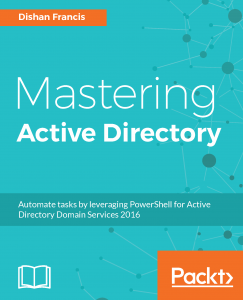 There are few ways to create user objects in Active Directory. If it’s using GUI, it can be done using Active Directory Administrative Center or Active Directory Users and Computers MMC. If it is using command line, it can be done using windows command-line or PowerShell. In this demo, I am going to show how we can create user object using PowerShell. In order to create a New User account using PowerShell the minimum value you need to pass is -Name. it will create a disabled user account and you still can define values for other attributes later. Enable – defines if the user account status is enabled or disabled. You can create a user account with minimum attributes such as Name and UPN. Then later can define a password and enable the account. User account cannot enable without a password. To define password can use Set-ADAccountPassword -Identity cmdlet and to enable account can use Enable-ADAccount -Identity cmdlet. Instead of executing multiple commands to create multiple user objects, we can create a CSV (comma-separated values) file which include data for attributes and use it to create accounts in one go. In demo I am using following CSV file. This is my first blog post in 2018. So, first of all Happy New year to my blog readers! In many occasions, I have written articles about Active Directory Migrations. But still I get lots of emails from readers to clarify things about AD migrations. So, I thought to revisit it by covering most common questions I gets. 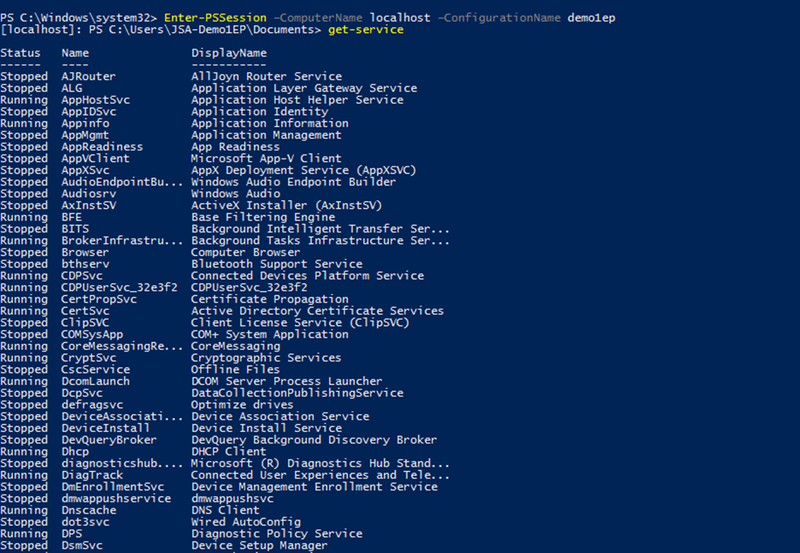 Also in this blog post, I will show how to do the AD migration only using PowerShell. Migration task itself is very straight forward. But there are other things you need to consider before you do an AD migration. In below I listed a checklist you can use in many occasions. Tips – During audit process you need to verify if your applications will support new AD schema. it is very rare but I have seen legacy applications which is not support newer schema versions. Also in some scenarios, it is hard to replace primary dc with a DC running with different IP address. 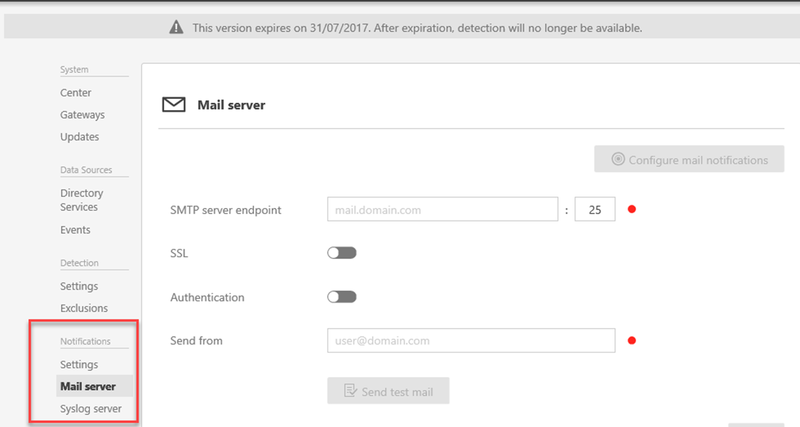 AD is supported for IP changes even after FSMO role changes. There for if need you can swap IP addresses after you migrate FSMO roles. 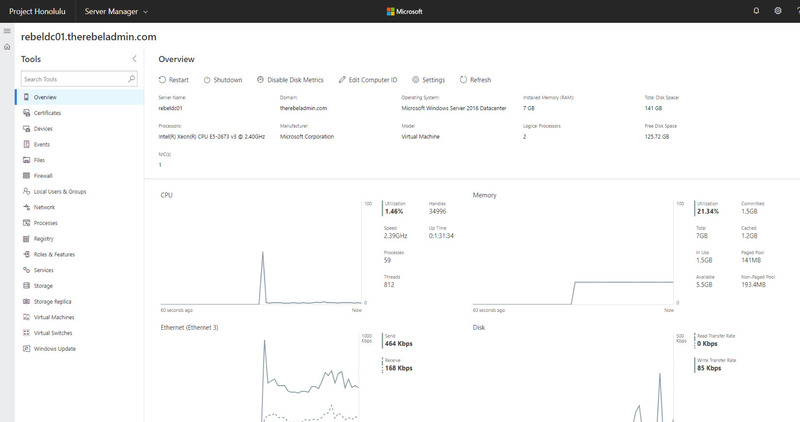 In my demo environment, I have an existing domain controller running with windows server 2012 R2. I am going to migrate it to a windows server 2016 server. 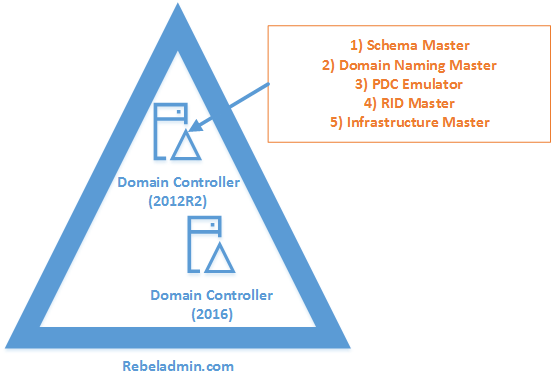 In the demonstration, REBEL-WIN-DC01 is the domain controller with windows server 2012 R2 and REBEL-SDC01 is the domain controller with windows server 2016. Tip – When you introduce new domain controllers to the existing infrastructure it is recommended to introduce to the forest root level first and then go to the domain tree levels. As per plan I need to add a new domain controller with windows server 2016 to existing domain first. 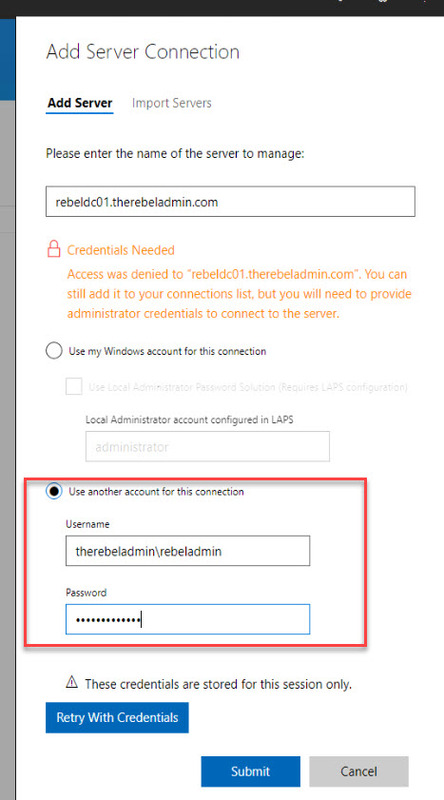 1) Log in to the Server (Windows server 2016) as a member of local administrators group. 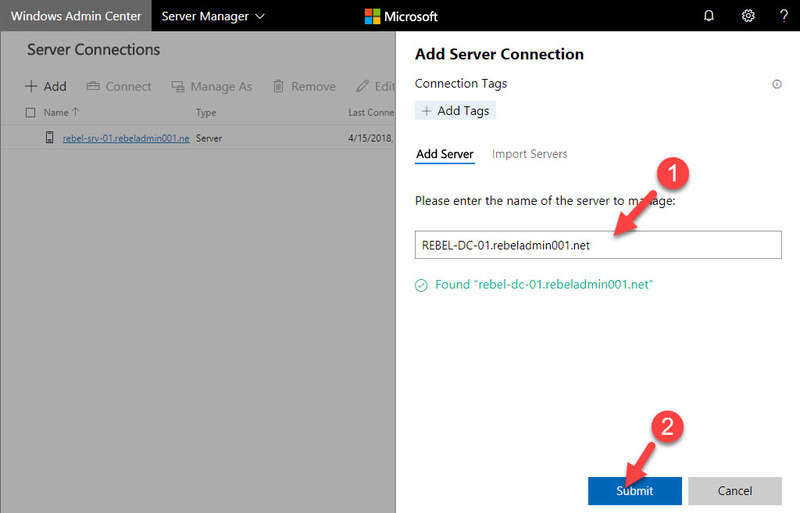 2) Add server to the existing domain as member. 3) Log in to domain controller as enterprise administrator. 4) Verify the static IP address allocation using ipconfig /all. 6) Before the configuration process, we need to install the AD DS Role in the given server. In order to do that we can use Following command. 7) After successful role service Installation, next step is to configure the domain controller. It can be done using following PowerShell command. Using this can specify whether DNS role need to install with active directory domain controller. For new forest, it is default requirement to set it to $true. Log path can use to specify the location to save domain log files. This parameter will force command to execute by ignoring the warning. It is typical for the system to pass the warning about best practices and recommendations. After configuration completed, restart the system and log back in as administrator to check the AD DS status. Now we have additional domain controller and next step is to migrate FSMO roles to the new server. 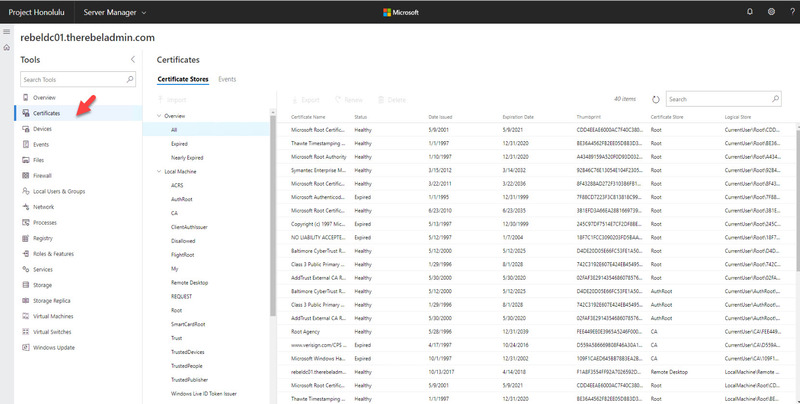 Now we moved FSMO roles over and next step is to decommission old DC which is running with windows server 2012 R2. Once its completed it will be a member server of the rebeladmin.com domain. After you remove your last domain controller running with windows server 2012 r2 (if its 2012 or 2008 r2 same thing apply) we can raise Domain and Forest Functional level to windows server 2016. You need it to have features comes with AD 2016. After the migration completes we still need to verify if its completes successfully. To search event ID 2039 and 2040 in the “Directory Service” log which will show the forest and domain functional level updates. Event ID 1458 will verify the transfer of the FSMO roles. 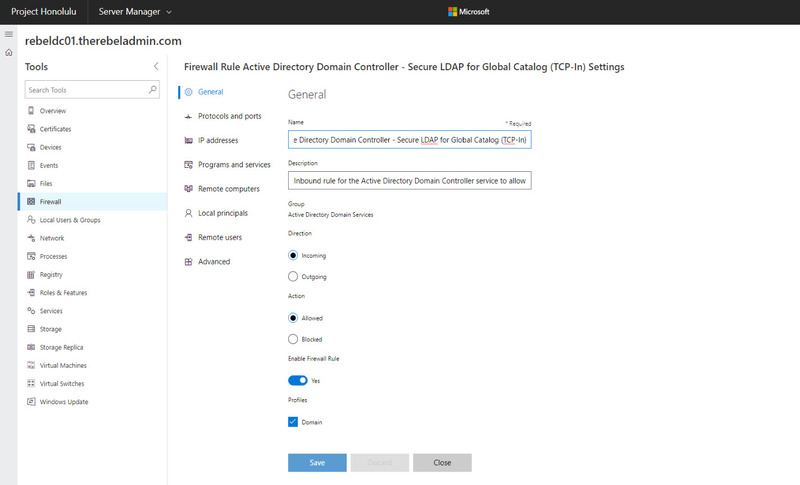 You can use following to verify the list of domain controllers and make sure the old domain controller is gone. Apart from these you also can go through Directory Service and DNS Logs to see if there’s any issues recorded. If you worked with windows server 2003 or earlier before, I am sure you know how painful it was to install roles and manage those. We had to go through “Add or Remove Windows Components” and many “MMC”. Also, it was recommended to run “Security Configuration Wizard” before install roles as security settings not come default with role installation. To address these difficulties Microsoft introduced “Server Manager” with windows server 2008. It replaced many of wizards’ server 2003 had. It made roles and feature management easy. It was further developed and was available with every server operating system released after windows server 2008. Project “Honolulu” from Microsoft is to bring server management in to next level. It is simple but powerful web based interface which can install on windows 10 or windows server 2016. It can use to configure and troubleshoot servers locally or remotely. 1. Simplified one web console for server management – Instead of using multiple MMC to manage resources, Honolulu gives simple web based interface to do it. It also allows to go from simple role install to advanced troubleshooting using same console. 2. 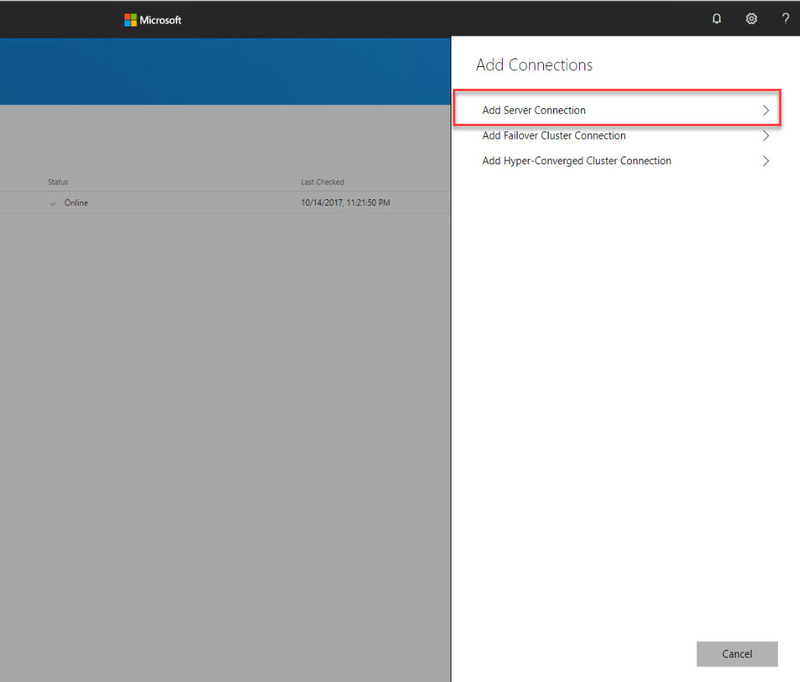 Better interconnection – With Honolulu we can connect windows server 2016, windows server 2012 R2, windows server 2012, Hyper-V 2016/2012R2/2012 in to one console. It also allows to manage failover cluster, hyper-converged environments from same console. Microsoft also working with partners to refine their SDK and extension model. 3. No Agents or No additional configurations – To connect servers to console it is not required agents or any other additional configuration. Only requirement is to have connectivity between gateway server and member servers. 4. Familiar tools packaged together – web based console allow you to access familiar tools from one place. For an example, you can access Server management, registry editor, firewall tools via console. Before we had to use different methods to open those MMC. This also make it easy to adopt without additional trainings. 5. Flexible for integration – the design itself welcoming third parties to create modules and integrate it with Honolulu so those applications or services also can manage via same console. 6. 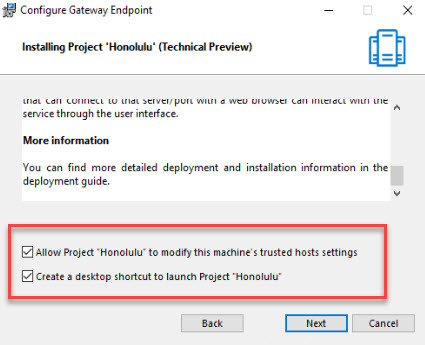 Can use to manage resources via internet – Honolulu web console (web server components) can publish to remote networks and allow engineers to manage servers without using traditional management methods such as VPN, RDP etc. Will it replace other management tools? At the moment System center and Operation Management Suite (OMS) provides advanced infrastructure management capabilities. Project Honolulu will be complementary to those existing tools but it is not mean to replace in any mean. 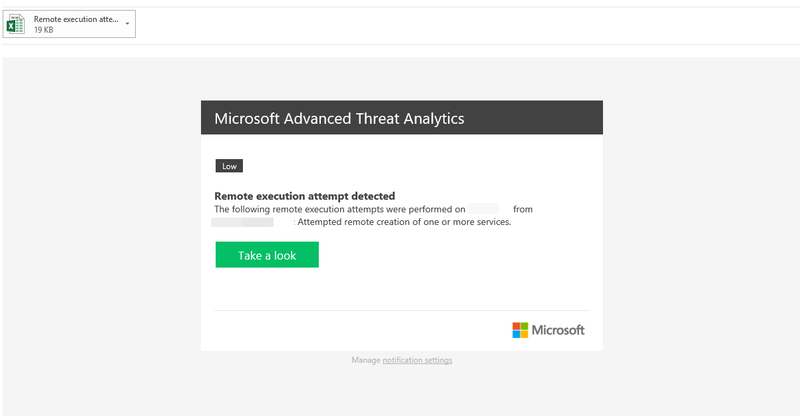 Is it got anything to do with Azure? No, it is not. It can use with in azure VMs too. Console doesn’t need internet access even to operate. At the moment, it is in technical preview stage. It will be released in year 2018. However, this will not prevent you from testing and providing feedback to improve it further. Is it supporting all operating systems? It can only install on windows server 2016 or windows 10. However, if you need to manage windows server 2012 R2 and 2012 you need to install Windows Management Framework (WMF) version 5.0 or higher first as required PowerShell features not available in earlier versions. Web Server – It is the UI for Honolulu and users can access it via HTTPS requests. It also can publish to remote networks to allow users to connect via web browser. Now it’s time to install and play with it. 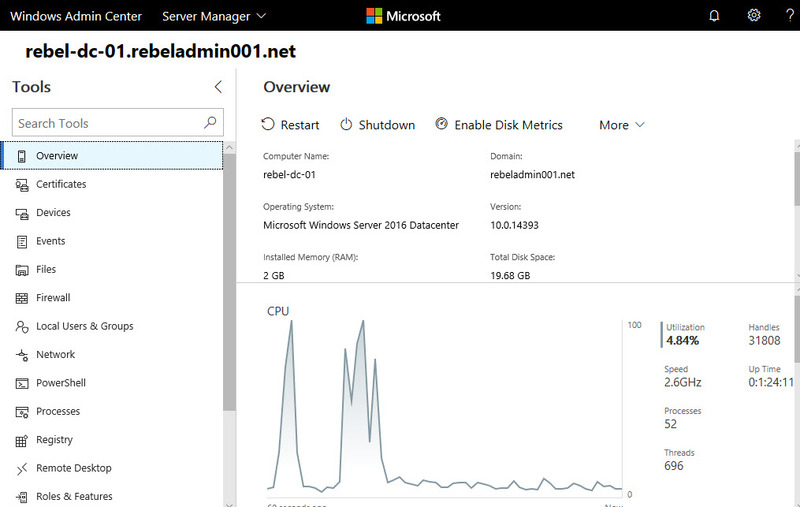 In my demo environment, I have two windows servers 2016 under domain therebeladmin.com. I am going install it on one server and get both servers connected to the console. 3. Double click on .exe to install. 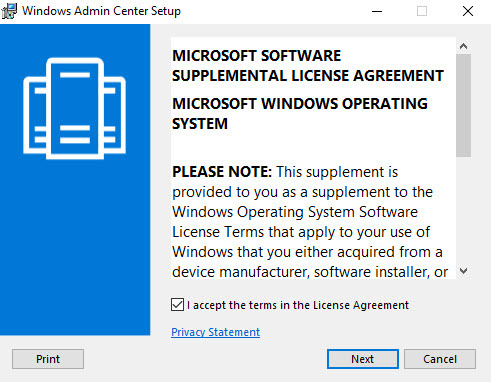 In initial window accept the license terms and click Next to continue. 4. In next window click on tick box to select “Allow project “Honolulu” to modify this machine’s trusted host’s settings”. In same window can select “create a desktop shortcut to launch project “Honolulu”” option to create desktop shortcut. 5. In next window, we can define a port for management site. For demo purpose, we can use self-sign certificate to allow HTTPS requests. once selections are made, click Install to proceed. 6. Once installation is completed, double click on shortcut to launch the console. Note : Console is recommended to use on Edge or Chrome browser. If you using IE, it will give error saying to use it on recommended browser. 7. In initial window, it will launch a tour to explain project Honolulu. You can either follow it or skip. 8. In home page, it lists the servers added to console. By default, it has the server it is installed on. 9. To add new server to the list, click on Add button. 11. In next window, it asks the name of the server. please provide server name and click on Submit. You need administrator account to add server to console. In my demo, I am using domain admin account to install and configure Honolulu. If you are in workgroup environment, it will give option to define admin account user name and credentials. We also can import multiple servers using .txt file. Once its added, it will show up on home page. 12. In order to manage server, click on the server name in homepage. Then it will bring up the server overview page. In this page, it gives real-time information about server performance. It also provides data about server resources. not only that it also gives options to restart or shutdown server, access settings and edit computer name. 13. Using Device tab, we can view the details about the server hardware resources. 14. Certificate tab allows to view all the certificates in server. more importantly it shows certificates for local machine and current user in same window. If its traditional method we have to open this using MMC. 15. Events tab shows all the events generated in server. 16. Files tab works similar to file explorer. 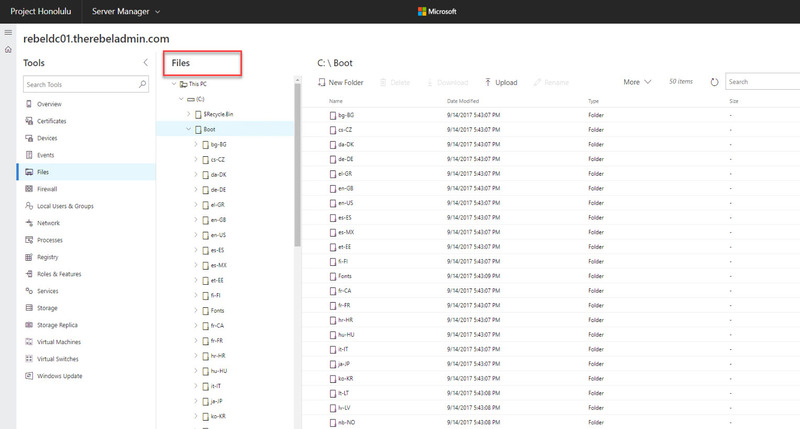 You can create folders, rename folders and upload files to folders using it. unfortunately, you can’t change permissions of the folders at the moment. 17. Firewall Tab is one of my favorites. Now it is easy to see what each rule does. It also allows to modify rules if needed. 18. Registry tab is also very useful. Using same console now we can add or modify registry entries. 19. Roles and Features tab allow you to install/remove roles and features. 20. Services tab work similar to traditional services mmc. It can use to status of services, start services, stop services or change startup mode. 21. Storage tab helps to manage allocated storage to server. In this blog post, I tried to go through each option but I like to encourage you to go and check its capabilities in details. It is easy to implement yet powerful. This marks the end of the blog post and hope it was useful. If you have any questions feel free to contact me on rebeladm@live.com also follow me on twitter @rebeladm to get updates about new blog posts. When AD password will expire? In Active Directory environment users have to update their passwords when its expire. In some occasions, it is important to know when user password will expire. In my example, it gave 131412469385705537 but it’s not mean anything. We need to convert it to readable format. In above the value was converted to datetime format and now its gives readable value. We can further develop this to provide report or send automatic reminders to users. I wrote following PowerShell script to generate a report regarding all the users in AD. This creates HTML report as following. It contains user name, last password change time and date and time it going to expire. The attributes value I used in here is SamAccountName, pwdLastSet and msDS-UserPasswordExpiryTimeComputed. pwdLastSet attribute holds the value for last password reset time and date. Hope this was useful and if you have any questions feel free to contact me on rebeladm@live.com also follow me on twitter @rebeladm to get updates about new blog posts. In this part of the post I am going to demonstrate how we can setup ATA. Before we start I like to explain about the demo environment we going to use. This deployment is going to use AD environment which running AD DS 2016 with Forest and Domain functional levels set to Windows Server 2016. All the servers used in the demo is running with windows server 2016 with latest updates. In demo, we are going to use ATA Lightweight Gateway, which will be installed on domain controller directly. There for no port mirroring or separate gateway server required. All the SSL used in deployment are self-signed certificates. 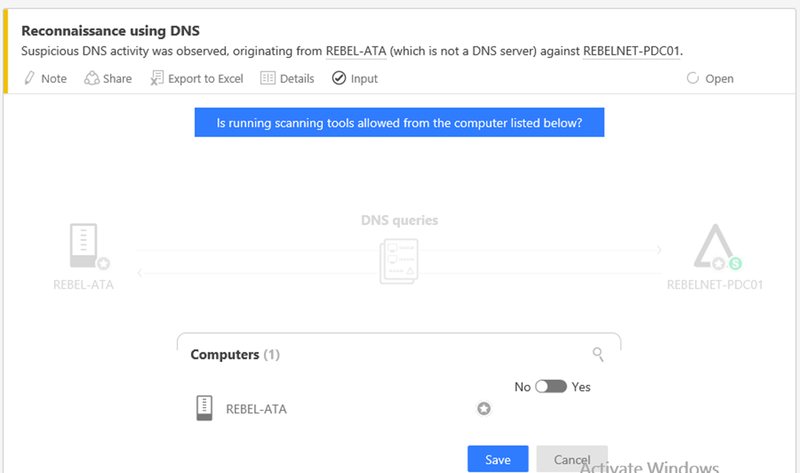 We will be using separate service account to connect ATA center with Domain Controller. 1) Log in to the server which is planned to use as ATA center as domain and or enterprise administrator. 2) Download ATA Center Installation files. It is allowing to use 90 days’ trial as well. 4) Then In the first window select the relevant language and click Next. 6) Then it asks how you like to know about updates. It is recommended to use Microdot Updates for that. 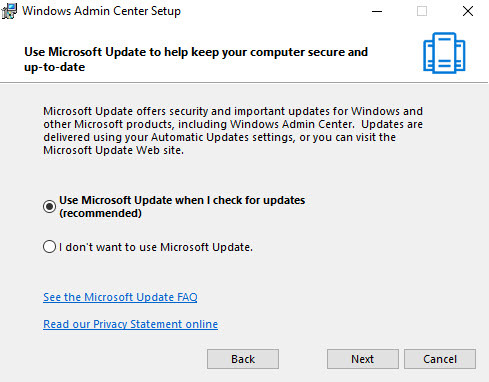 Choose option Use Microsoft Update when I check for updates and then click Next. 7) Then in next window we can define application installation paths, database path, center service IP address and port, SSL certificates, Console IP address. After changes, click on Install to begin the installation. 8) Once installation finished, it will give option to launch the ATA center. 9) After launch ATA center, log in to it using the account used to install ATA center. If you need later you can add additional administrator accounts. 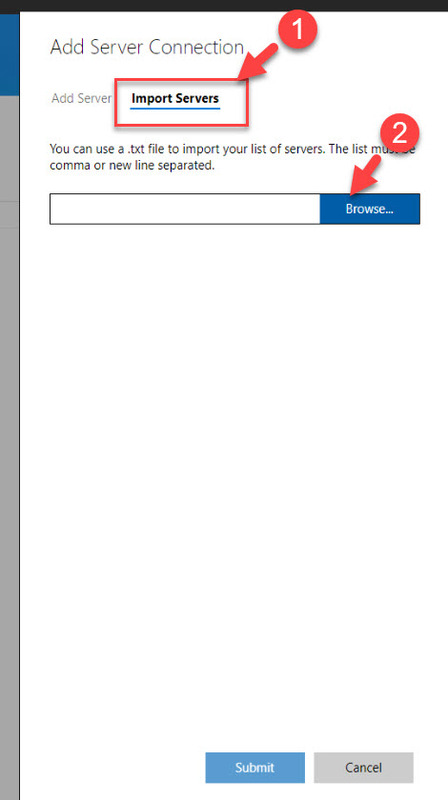 10) As soon as login, it gives window to provide account and domain info to connect to Active directory. Type the service account info you going to use for this. This account is just a typical user account and no additional permission needed (except read permission for all AD objects). once account details entered, click on test connection option to verify the connection and then click on Save. 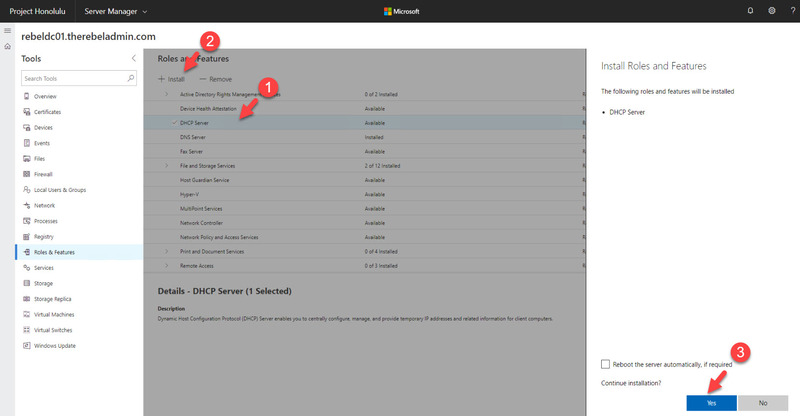 1) Log in to the Domain Controller as Domain Admin or Enterprise Admin. 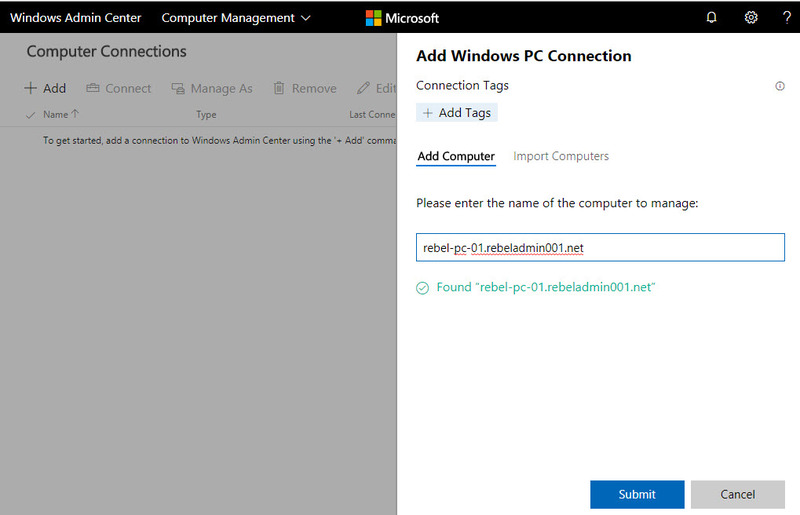 2) Launch IE and connect to ATA Center URL. It is via the console IP we specify during the ATA center installation. 3) Log in to ATA center as an Administrator. 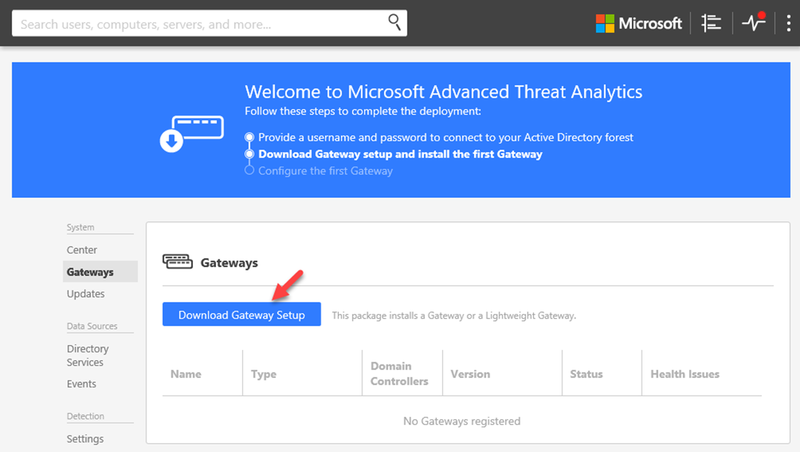 5) In next page, it gives option to download the Gateway Setup files. Click on the download button to download the installation files. 7) In language page, select the relevant language and click Next to continue. 8) Then, it will give the confirmation about deployment type. By default, it detects the type as Lightweight Gateway. Click Next to proceed with the deployment. 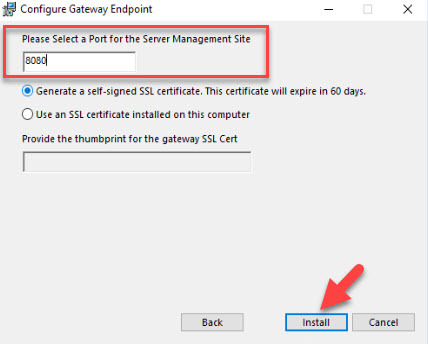 9) In next window, we can specify the installation path, SSL certificate information and account details to register the gateway with the ATA center. This account should be a member of ATA administrator group. once all typed in, click on Install to begin the installation. 10) Once it completed, log in to ATA center and verify if you can see it is successfully registered. 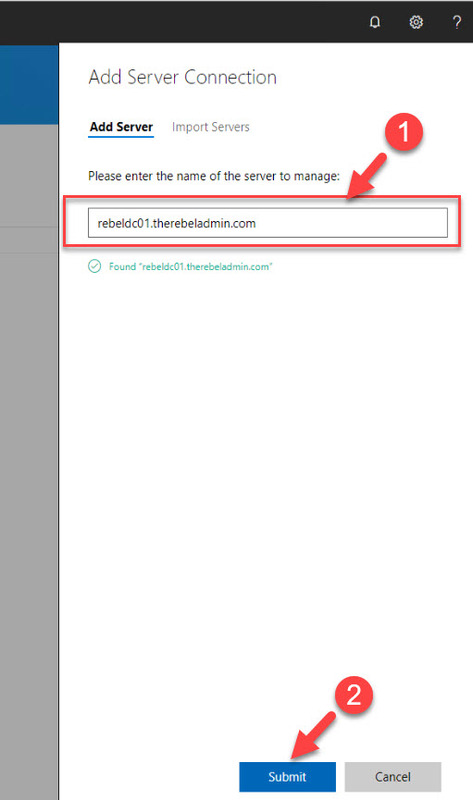 2) Open the command prompt and type, nslookup – REBE-PDC01.therebeladmin.com and press enter. The server name can be replaced by any available domain controller FQDN. 4) Then log in to ATA center and check the timeline. There we can see the detected event. Then, once an event is raised it will sent out an email alert too. I was off from blogging for few months as I had to spend my free time on another task which will help all of you more. Stay tuned! More info will share soon. Anyway, I am back on blogging! JEA was first introduced in 2014 and it was the first approach towards the privilege access management comes with windows server 2016. JEA allows to provides role based privileges instead of full administrative privileges. Peter is working in 2nd line support. Every month he needs to run script against helpdesk system to create custom report which indicates monthly support tickets progress. In order to do that he log in to helpdesk server and run the script. This script needs to run as administrator of the server. there for he is member of administrator group. However, this is the only task he run on that server with such privileges. Administrator of a server has privileges to do almost anything on the server. if someone else got access to peter’s account, nothing will prevent from changing entire helpdesk system. Using JEA, we can assign just enough privileges for peter to run the scripts from helpdesk host instead of giving administrator privileges. Privileges assigned for peter is only valid for helpdesk server and he cannot run same script from another server. This is fully worked with PowerShell. Not everyone uses PowerShell. Not supported with each and every management tasks. If you working with script which works with multiple hosts it will difficult to use JEA. Not every third-party application support to work with JEA. If above limitations stopping you, most suitable solution with be the privileged access management with windows server 2016. 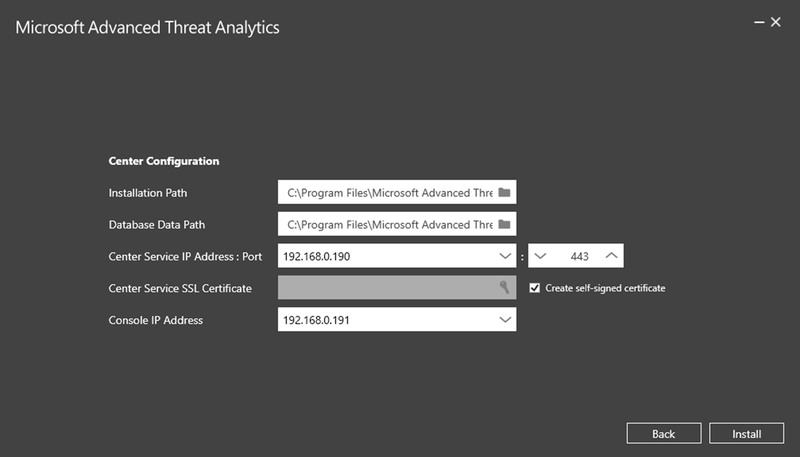 Privileged access management will be covered in later blog post. This allows to map users to the hosts. Using it we can map users, groups to specific management roles. It also allows to configure global settings such as virtual accounts and transcription policies. PowerShell Session Configuration file is system specific. There for, configuration settings can apply per-host basis. These configuration files specify what actions can perform by the users. It can be a running a script, running a service, running cmdlets or running a program. These tasks can group in to roles and share it with other users. In this demo, I am using a system with windows server 2016 with latest updates. In order to install JEA, we need to log in to the system as local administrator and open the PowerShell. 1. Then run command, Install-Module xJEA. It will ask few questions before it import some modules. Provide appropriate answers to install them. That’s it! we done the installation and initial configuration. As per the above it only allowed to use following cmdlets. According to above Stop-Process cmdlet only can use to stop calculator and notepad process. But it allows to use Restart-Service, Get-Process, Get-Service cmdlets. In above –ConfigurationName defines the endpoint name. in the backend JEA commands execute using JEA local administrator account. This login details no need to know by end users and its password been reset on daily basis automatically. This user is setup as part of the installation process by JEA. Once session is connected, we can test it with an allowed command first. According to configuration we allowed to run Get-Service command without any limits. The use I logged in to this computer is a local administrator. So, I have enough privileges to restart the computer using Restart-Computer cmdlet. But now I am connected to endpoint. According to endpoint config it should not allow me to do so. Voila! It is working as expected. there are lot of channel9 videos, articles out there which discuss about JEA capabilities. I encourage you to go through them and get more understanding on this great tool. Also through the GitHub you can find lot of sample endpoint configurations. In new AD DS 2016 allows administrators to assign temporally group membership which is expressed by TTL (Time-To-Live) value. This value will add to the Kerberos ticket. This also called as “Expiring-Link” feature. When user assign to a temporally group membership, his login Kerberos ticket granting ticket (TGT) life time will be equal to lowest TTL value he has. This feature is not enabled by default. The reason for that is, to use this feature the forest function level must be windows server 2016. Also, once this feature is enabled, it cannot be disabled. Rebeladmin.com can be replaced with your FQDN. I have a user called Peter which I need to assign Domain Admin group membership for 15 minutes. Get-ADGroupMember “Domain Admins” will list the current member of domain admin group. Next step is to add the peter to the domain admin group for 15 minutes. Once I log in as the user and list the Kerberos ticket it shows the renew time with less than 15 minutes as I log in as user after few minutes of granting. Once the TGT renewal come the user will no longer be member of domain admin group.